Includes all DLC (both nemesis and story expansions). Includes the two story expansion DLC. Free. Must be installed to use Ultra textures. No longer available for purchase since the May 8, 2018 update that removed microtransactions from the game. Go to <path-to-game>\game\interface\videos\legal and replace the files. The game keeps 5 backup saves named <user-id>_#_ShadowOfWar.sav. The <user-id> for the Steam save is the SteamID3 of the account in hex format. Only the latest save is backed up. Cutscenes and menus are 16:9. FXAA, TAA, SSAA through Scaled Resolution option. Menu controls cannot be remapped away from default WASD. Slider with arbitrary minimum and maximum values. 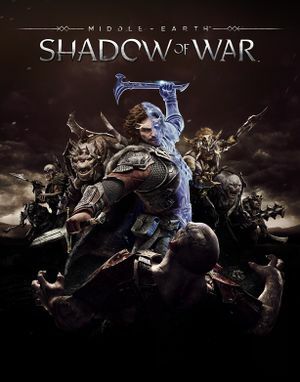 See Helix Mod: Middle Earth: Shadow of War (DX11). ↑ 1.0 1.1 File/folder structure within this directory reflects the path(s) listed for Windows and/or Steam game data (use Wine regedit to access Windows registry paths). Games with Steam Cloud support may store data in ~/.steam/steam/userdata/<user-id>/356190/ in addition to or instead of this directory. The app ID (356190) may differ in some cases. Treat backslashes as forward slashes. See the glossary page for details.